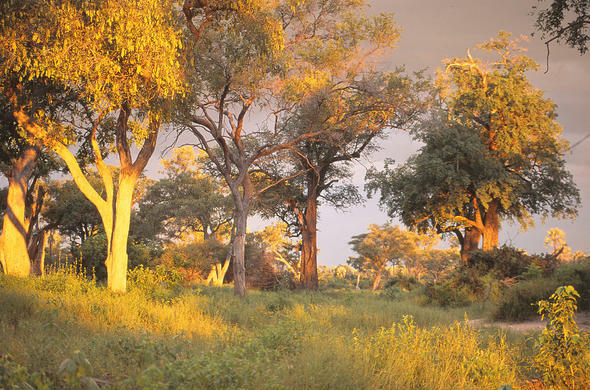 For an all round safari with a mix of land and water based game experiences, staying in true African-style tented camps or river-side lodges, there is nowhere in Africa that can offer more than the Okavango Delta. When it reaches the Okavango Delta the river moves gently through a wide winding channel where it leaks through unnoticeable pathways and creeps through reeds into an ever expanding network of increasingly smaller passages. These link to a succession of water-lily lagoons, palm-tree islands and grassy knolls, with open grassland, forest glades and flooded plains forming a mosaic of land and water.Although called a 'swamp', the Okavango is in reality a gently moving entity with a strong current rushing through the larger channels and dawdling slowly through lily ponds. The delta fluctuates in size according to a complex relationship between the annual flood from Angola and local rainfall. Not all the 13,000km² is flooded and at the driest time of the yearly perennial flood plains amount to only 6,000km². The Okavango's water is wonderfully clean and pure because it journeys through very sparsely populated areas. It is in fact good enough to drink even though a staggering 660,000 tons of sediment is delivered in it each year. Like a sieve the reeds and grasses of the Delta filter this rich soil and in this subtle way enriches the whole area.Man has lived in the Okavango certainly for the last 300,000 years as Stone Age tools have been found, and San Bushmen who normally practised their hunter gather lifestyle in the desert, took advantage of the Delta's resources. These River Bushmen remain but are not readily distinguishable from many other groups of people who now inhabit the Delta.Surviving in the Okavango was not hard with good fishing, ample game and drinkable water. There can have been few better places to live a simple lifestyle than here. For the present day visitor, a pair of binoculars and a good camera is essential to catch the colourful array of birds (350 have been recorded) and alert faces of animals.Fishing can be a relaxing pastime or a real challenge with Tiger Fish found in the deeper faster water near the fishing camps in the panhandle at the north of the Delta, and August to February are said to be the best time. Bream are easily caught and mud-dwelling Barbel are common and some say, if gutted quickly, do not necessarily have the 'muddy' taste they are reputed for.Quite simply, a multi-centre safari that includes the Okavango Delta, in which you visit a couple of lodges each offering something different, will leave you feeling like you have had the best safari holiday of your life.The author suggests including Victoria Falls, Chobe National Park and the Okavango Delta in one itinerary. Spend the last couple of days at a relaxing riverside lodge such as, Impalila Island Lodge or Susuwe in the Caprivi Strip of Namibia or The River Club or Tongabezi near Livingstone Zambia, all of which are on the banks of the Zambezi.The author flew around the Okavango Delta with the assistance of a very efficient Delta Air and stayed courtesy of Sanctuary Lodges, Delta Camp and Kwando Safaris. The author is not obliged to recommend any lodge and her impressions and recommendations are purely personal.Copyright © 2002 Carrie Hampton. All rights reserved. Reproduction in whole or in part without the permission of the author is prohibited.